This trip was a bit of a weird one as it was booked pretty spontaneously so even up to the point of getting on the plane it didn't feel like we were really going! Arriving on Friday night, we hopped in a cab and tried to learn some lingo from our driver, and travelled to our Air Bnb which was the cutest. Set in the centre of the city, we'd rented a studio apartment with gorgeous almost floor to ceiling windows, a cosy living area and a lovely little spiral staircase up to a mezzanine over one side of the room where we slept. Lucy and I are not ashamed to say we acted out Rapunzel over the balcony. We live a wild life, I know. Saturday came along and we woke up to blazing sunshine flooding the apartment. It was very aestetic and we couldn't wait to set off. 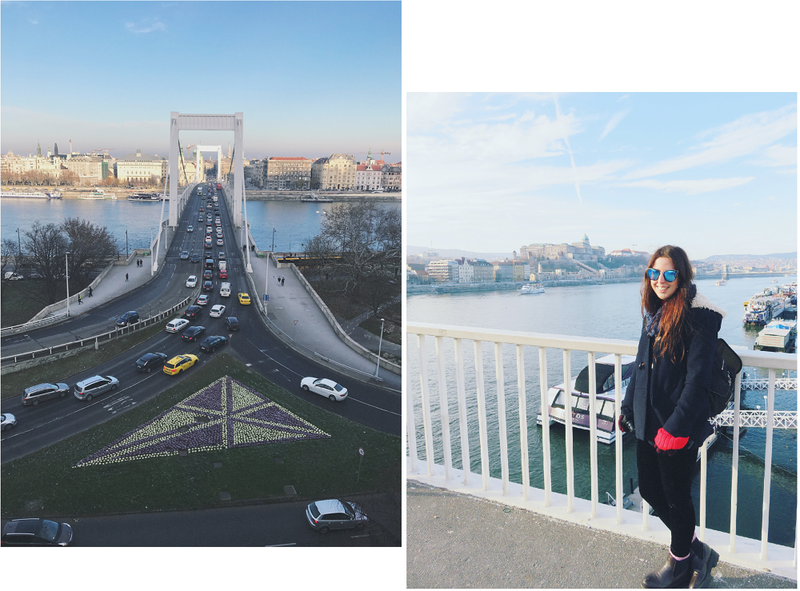 We took a walk through town, ate pretzels the size of our heads at a Christmas market and then decided to brave climbing up Gellért Hill to reach the famous Liberty Statue. We crossed over from Pest (the flat, trendy side of town) to Buda (much posher and mountainous) by walking over Elisabeth Bridge (Erzsébet híd). This takes you across the River Danuabe. It was a walk and a half and I'm pretty sure halfway up the hill I lost feeling in my fingers because I kept taking my gloves off to film snippets on my phone. #firstworldproblems. When we reached the top of Gellért Hill (more like a mini mountain ngl) it was just before sunset and the views were beautiful. We could see the whole of Budapest and the lighting was stunning. I couldn't stop taking photos and looking around in awe. To give you a little insight into what Liberty Statue is all about, so if you plan on visiting you can be informed (I was most definitely not), the statue was built in 1947 after World War II. It's to remember the liberation of Hungary and to remember those who sacrificed their lives for independence and freedom. After taking as many photos as possible we decided to start walking back down and make our way to Buda Castle. On our way, we came across a few Christmas market stalls dotted around the place and one was selling hot apple cider. Now friends, if you're visiting Budapest in the winter, make sure you buy some of this! It was like drinking apple crumble and helped bring my frozen fingers back to life. At this point, we lost the sun but took a walk to the castle anyway. By the time we arrived, it was actually freezing. I've been to Iceland before a few years ago so thought I knew cold, but this was SO COLD. I think it didn't help we'd been outside nearly all day, and so after getting a few night time snaps (hella worth, the city is so pretty all lit up) we retreated back to our flat to warm up for a bit. Once we'd defrosted, Lucy and I popped back into town and played it safe with the Hard Rock Cafe. Perhaps not very Hungarian but hey, we wanted food asap and were saving the Hungarian cuisine until Sunday. After stuffing our faces and perhaps having one cocktail too many (oops) we went for a scenic walk through town where we took in the sights. Everything is very pretty at night in Budapest all lit up, especially at Christmas time. It all feels very festive and you'll be reaching for your camera constantly. Once we made it back to the flat, we popped open a couple of ciders we'd bought earlier in the day (from a Tesco's would you believe!) and rocked out to MTV on the TV. Music channels were the only thing not in Hungarian so we stuck to them. It was that or BBC News which was a little too depressing for a holiday. I'm well aware that this post is mighty long and boy did I not mean for it to end up like this, but I feel like I need to do each part of the trip justice! Sunday Funday. We had a blast on Sunday and I think it was my favourite day of the two full days we were in Budapest. We woke up to snow! Not crazy amounts but this was very exciting. After publishing a post on Sunday morning (catch up here, it's a good'un) we set off for the castle again. This time we'd wrapped up extra warm, (we wore tights under our jeans - I couldn't feel my legs lol) and began. This time we took a different route through town, walking along the riverfront and crossing over Chain Bridge (Széchenyi lánchíd) where we got a lot of great snaps of surrounding buildings. Once we reached the base of Castle Hill, we had two choices. Either walk or hop on Buda Hill Funicular. This is a type of train which goes up and down steep hills. It's pretty sick, but there was a long queue so we opted to walk. Honestly, if you've never been on a funicular before, try it, but the walk really didn't take that long and was much quicker than the walk up to the Liberty Statue on Saturday. That really was a hike. When you get to the top, it's really magical. The castle itself is huge - although it doesn't look like the castles we have in the UK, it's amazing to look at and admire. The views from the city up there are amazing and you must stop and take a breather whilst looking around. It's so, so, so worth the walk. After admiring the view, we went back down to the base of the hill and then started off a lot of steps in the direction of Fishermen's Bastion (Halászbástya). With hindsight, I think there is a way to walk across between the two without going up and down in between, but yolo we got so many FitBit steps. To me, it looked like we were entering Hogwarts and was truly beautiful. The stones were all so white and everything looked uh-maz-ing. This was probably my favourite place we visited just because the detail in all the architecture was mindblowing. This again is another place where you need to stop and get loads of photos of the city. You can get really good views of Parliament from here and I'm sure if you went in the evening everything would look even more magical. This is also the location of Matthias Church (Mátyás-templom), a Roman Catholic church which is quite simply, stunning. Seriously if you like architecture this is the place to visit. Once we'd filled up our cameras with lots and lots of photos, we went in search of food. We were freezing again and wanted to gorge on food and hot chocolate. And we found the perfect place. Ramazuri Bistronomy is just down the road (literally) from Matthias Church and it feels a bit strange because it's so, so quiet outside, then you walk in and it's full of hustle and bustle, delicious smells and most importantly, it's warm and cosy. 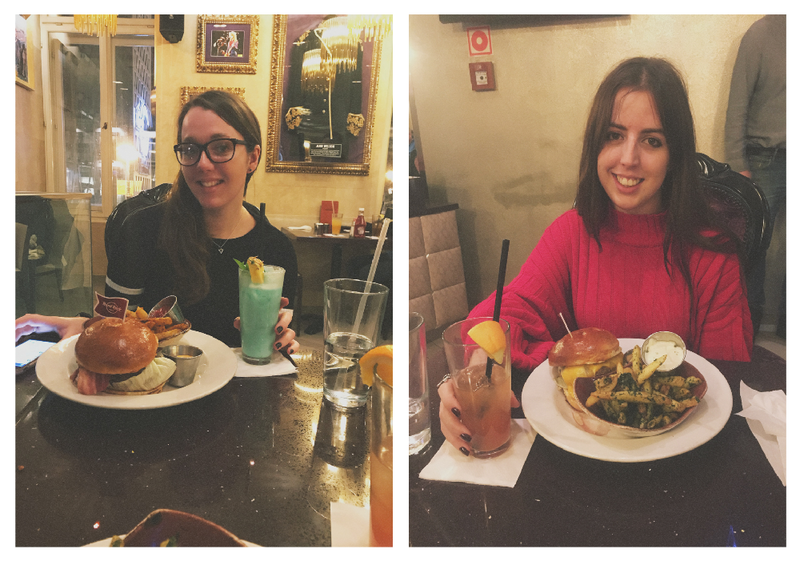 We ordered a hot chocolate #obvs, and the Beef Goulash which was just what we needed. It was real comfort food and my goodness did it hit the spot. I probably could have eaten two bowls of the stuff it was so good. I'd really recommend visiting here if you've been out in the cold for a few hours. Nearly there, you've neeeeeearly reached the end. As we were, after warming up we walked back into Pest, and after a little confusion as to how to validate our newly bought metro tickets, we hopped on to Budapest's underground. Both trains and trams really look like toys - it's very cute. And they're both yellow - double cute. We headed to Heroes' Square (Hősök tere) and as soon as we came out of the station we like "Wow". The scale of these statues is like, unbelievable and it's hard to capture the scale of it on camera. It's hard to fit all of it into one photograph - it's huge. But it's beautiful, and by this time it was dark so everything was lit up and, although I've said it way too many times already, it looked so pretty. After this, we walked past a lake behind the statues which looked exactly like a Lowry painting - no joke - and made our way to Széchenyi Medicinal Bath (Széchenyi-gyógyfürdő). This is the largest medicinal bath in Europe and you'll probably see it in everyone's snaps from Budapest. I wasn't up to actually going in the baths whilst we were there, but Lucy went in and had a fab time. If you need rejuvenating, this is the place to go. Finally, don't worry the end of the post is near, we went downtown to Spíler, this is near all the ruin pubs. It was super cute here (a tiny bit cold but they do provide blankets) and very red - my fave colour of the moment. Lucy and I drank a lot of cocktails here because we had to try as many as possible right? We shared some chicken wings to start which were coated in a really sweet sauce. Tbh I'm not usually a fan but this changed me and now I want them again. Right now. Lucy then had a Hungarian pizza for main, and I had Chicken Paprikash with buttered Spaetzle - that's chicken in a sauce with these noodle/pasta things. The texture is really hard to describe but the whole meal was lovely. It was more make us feel good comfort food and I was stuffed by the end of it. The waiters here were also top-notch, full of bants. That night we went back to the apartment and drank the rest of our cider and got very merry. If you're on holiday, you gotta do it! Then the next morning we headed to the airport after a fleeting visit to Parliament. Honestly, I have rambled on way too much and I'm pretty sure no one will scroll this far down but YOLO sometimes you just gotta write stuff like this down ya know. For the memories. Whilst I was in Budapest I couldn't really tell if I liked it or not, I've never been to that part of the world before so it was very different to what I'm used to, however now I'm home and have poured my heart and soul into this post - I think it's clear I enjoyed it. I think I'll go back someday. If you got this far, THANK YOU. Mad respect, you have the patience of a saint.